When it comes to the September Retail Sales report, it has historically been one of the worst ones relative to expectations. Based on data from our Economic Indicators Database, the headline reading has only exceeded consensus expectations five times going back to 2001. That’s less than a third of the time! This year was no exception as we saw a big miss relative to expectations on the top line and a similar miss after stripping out Autos and Gas. Our monthly update on Retail Sales, always highlights a number of key trends reflecting changing habits of the US consumer. This month’s report was no different. One interesting trend we wanted to highlight was the shift from ‘eating in’ to ‘eating out’. For several years now, we’ve seen Bars and Restaurants increase their share of total sales at the expense of Food and Beverage Stores. 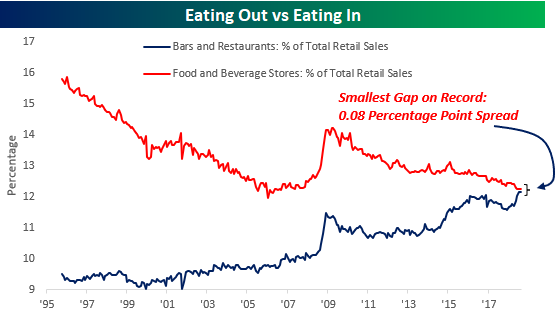 As shown in the chart below, though, this shift is on the verge of a major inflection point where Bars and Restaurants will overtake Food and Beverage stores in terms of their total share of retail sales. The house of tomorrow may not have a kitchen! For anyone with more than a passing interest in the changing behavior of US consumers, make sure to check out this report. To see it, sign up for a monthly Bespoke Premium membership now!